With the holiday quickly approaching and many people looking to purchase gifts for their loved ones, I thought I'd throw out a handy dandy gift guide. I find that many of my relatives don't quite understand my hobby. It's not like watercolor painting or maybe scrap booking, where someone can easily get me a gift card for the local art supply shop and feel like I'd absolutely love them for it. Our hobby, involves a technical barrier that prevents idle purchase. Now my hints below will be primary for players inside the World of Warcraft, but much will apply to other gaming. Authenticator - In this world of key-loggers and hackers attempting to make money from gamers. This provides your gamer security, via a token that generates a random 6 digit key. This key is unique to their account and will need to be entered everytime they logon to the game. This $6 investment pays back in the form of not missing game play. (and it grants a free pet). Time - Time to explore and enjoy this world (Free) or time, in the essence of a prepaid month(s) of play. Blizzard sells time in blocks of 1 month ($15), 3 months ($42) or 6 months ($78). "Time is Money, Friend"
Real World Money for in-game perks - I would not condone purchasing items on eBay. Most of the items their are people who have found wining trading card game cards. Considering the TCG careds are only a few bucks a pack, why pay over $60 for an item here. Great fun, but most have charges, or limited use. 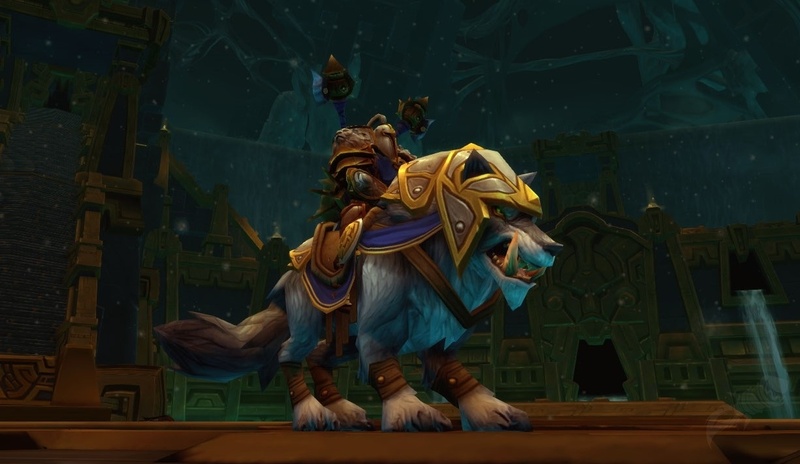 What I DO like, is the in-game pets and/or mounts. Currently the Moonkin hatchling is on sale for $10, with half that purchase price going to Make a Wish (now until 12/31/2010). Besides, he dances, he flys, he's all around cute. Gear/Hardware - Now unlike a gaming console, like xBox, PS3 or the Wii, your gamer is playing on a PC or Mac. What equipment you buy may play an important factor. Since there is an You may want to simply invest into a gift card for your gamer. NewEgg.com - online retailer with quick shipping and great rates. Best Buy - Numerous locations, prices a bit higher, but has a physical presence to shop at and look around. Apple - I know NewEgg and Best Buy have Mac accessories, but they may not sell some of the finer upgrades. Gamers need lots of memory - This equates to the how complicated the game can be (Warcraft is complicated) and how fast things come up. More memory faster game play. Gamers need fast graphics - I upgraded my video card from the stock card, to one around $150 and game play was dramatically different. I could complete game play that I could never even imagine. Laptop players and Apple devices may not be able to, but Window's Desktops, definitely. Play along! 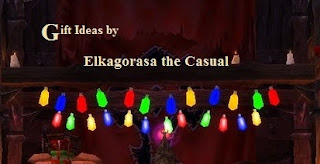 - If you are also a gamer, consider getting a Trial account and playing along. Your gamer will enjoy the perks of having you tag along, plus there's the rocket! $3 get's you the media (or download for free) to play through the starting areas of several races. There will be things you can't do, but plenty you can. Purchase pets from auction house, or in-game vendors. Gamers, what did I miss? Tell me what you'd want from your non-gamer friends and family and maybe we'll all benefit! 10-Person Ventrillo subscription - Vent is a Voice over IP solution used by gamers. It allows for 10 simultaneous people to communicate with each other. Think Party Line. My mom called it "Kid in a box". Best of all, anyone can use it. Want to chat with remote family members, while they travel? Want to have a party chat with 9 other people. 5 user subscription is free. A 10 user subscription is $50. Good chair. Gaming isn't that physically demanding, but sitting on one's derriere for several hours on a bad chair (at a badly configured desk) can be. A good setup is a 100x cheaper than physical therapy. Sorry, can't provide suggestions. I still sit on an extra kitchen table chair. Just remember the adage, "you get what you pay for". Steam Games - Steam is an online distributor of PC games. You install a small agent on your PC and then select games from the Steam Store. Check back later and you have it installed and ready to go. 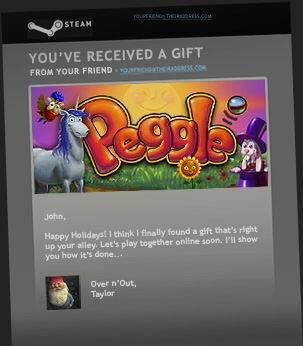 Right now Steam has a number of holiday gifts available, including Portal( click here for trailer) for only $4. Purchase the game online and say "Purchase as gift". Your gift is delivered as an email for them!